I am a little late sending out this September missive due to speaking trips on both our East and West Coasts. I was a keynote speaker at the wonderful Canadian Chefs Congress in Grand Pre Nova Scotia (the historic home of the Acadians prior to their expulsion by the British in the 1750’s). It was wonderful to visit with many of the acclaimed chefs I have had the privilege to work with while I operated Cookstown Greens; but it was disheartening to learn of the problems being experienced at my former farm. 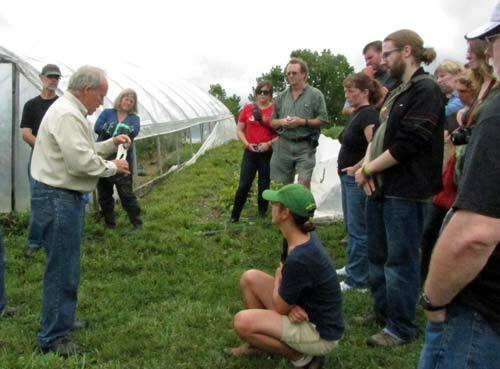 I took the opportunity to conduct workshops for market gardeners in both Nova Scotia and in New Brunswick. The following week I headed to the west coast’s Salt Spring Island. On Michael Abelman’s beautiful island farm we led a three-day market garden workshop along with the insightful American gardener, Josh Volk. A common interest at all these workshops was learning ways to provide exceptional flavour. My approach is to build the soil’s biological activity by feeding it chopped green organic matter and then minimizing disturbances from excess cultivation. For millennia plants and soil-life have been supporting each other in sophisticated ways (we need not understand). It is presumptuous to think that chemical fertilizers can sustainably replace this proven system. Some of Michael Ableman’s Foxglove Farm strawberries had a very high Brix of 13°. His Charentais melons measured in at an exceptional 16° (so high that a mere slice is more than enough for anyone to eat). In the workshops, I demonstrated how using a simple refractometer could objectively indicate how well this plant/soil-life dance was proceeding. Higher Brix levels indicate increases in dissolved solids (i.e. sugars, minerals and nutrients). Higher Diffusion indicates a wider variety of these solids (i.e. more complicated flavour profiles). 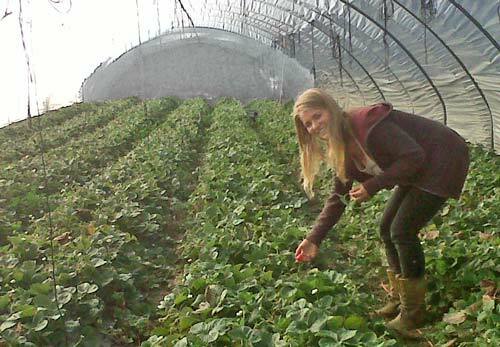 On the challenging soil of Nova Scotia’s south shore, Camelia Frieberg’s Watershed Farm had squash leaves measuring a very respectable 10° Brix with a chef-appealing diffusion of .5°. Exceptional flavour benefits farmers by making produce easier to sell at fair prices. It also benefits the chefs by making it easier to prepare memorable meals that customers will return for. And consumers benefit by needing less sugar, salt and fat to make their food appealing; plus they are less inclined to overeat this flavour and nutrient dense food. Yet another benefit is that better tasting food stores longer. The longer shelf-life contributes to reducing the abhorrent waste of one-third of our food. Longer shelf-life also dramatically extends availability which means extended selling seasons for our farmers. This in turn reduces imports (which is just as beneficial to our overall economy as increasing exports). As if this were not enough benefits, high Brix crops are very insect and disease resistant. Animals select high Brix foods; but then choose to eat less. Please visit my website to learn ways I might help you. Three University of Guelph professors feel it is important to continue the flavour research I was conducting at Cookstown Greens. With governments no longer providing “for the public good” grants, there was insufficient money to conduct the full project. Not to be stopped, they have found a way to proceed with a cut-down version of the research. 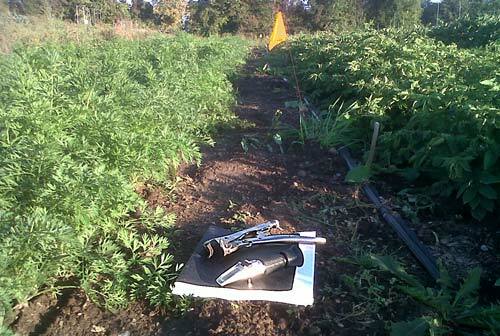 Carrots and potatoes are now being grown with varying amounts of compost. Curiously, the leaves with more compost exhibit lower Brix. Later, differences in root Brix, density, nutrients, flavour and shelf-life will be recorded. Since students are eager to do much of the work, the full project may require only about $100,000 in funding. The return on this will not likely be some product to sell. But it would provide knowledge for growing more flavourful (good-for-you) vegetables that people will not have to be pushed to eat. A side benefit could be extended in-season availability that would reduce our economy’s need for imports. If some private company, individual or foundation comes up with the first third, our governments will then consider funding the remainder of the project. There could be a lot of goodwill from initiating this. Please contact me for more details. Farming and Agrifood is already Ontario’s largest industry. It contributes $33 billion to our economy and provides 1 out of 7 jobs. If we ceased subsidizing exports of raw foodstuffs and then importing prepared foods, our industry would grow even larger. Every five years the federal, provincial and territorial governments revamp their multi-billion dollar agriculture subsidy programs. These subsidies remain the smallest in the developed world. But in these days ridiculously low food prices, something must be provided to maintain a modicum of food security by keeping some of our farmers in business. Thanks to the world-class productivity of Canadian farmers, Canada continues to “benefit” [or I should say “suffer”] from the lowest food prices in the world. The current Growing Forward program expires on March 31, 2013. For a [lengthy] idea of what will be coming, take a look at the government’s response to Growing Forward 2. The Ontario government is bringing forward a Local Food Act that could become very helpful. Even though there is not enough local food to meet the demand, there will be even more supports for food exports. The federal AgriInvest and provincial SDRM supports are the best programs for supporting the needs of “organic” farmers. Half of the benefits for organic growers will be transferred to risky mono-crop production in the form of heavily subsidized crop insurance programs. And then there will be even more funds for Genetically Modified crops that benefit only a few wealthy corporations. Is anyone in Ottawa listening? The 1.6% of Ontarians who farm cannot do much. So we need urbanites to pick up the banner to save our food. to receive this newsletter every month.